They say "once you get that Bynum mud between your toes, you'll always come back" and that is exactly what has kept the town going since the 1800's. Located off of Highway 15-501, Bynum was originally a cotton mill village set along the banks of the Haw River with the first mill built around 1872. As the mill grew, the town grew and became a vibrant community where neighbors knew each other and gathered together to celebrate and commiserate. In 1936, the Bynum General Store opened and was one of five stores in town. There was also a movie theater and a school. The mill closed in 1983 and Bynum’s community life started changing. Today, the mill is just a memory but the residents of Bynum are just as vibrant as years past and the longing to keep a community together continues to grow strong. The Bynum Music Series began in 2001. Bynum neighbors wanted to create an event that would bring people to Bynum, to help sustain the Bynum General Store and Post Office. The store was a historical landmark - one of the last businesses in Bynum - and the social center of the community. 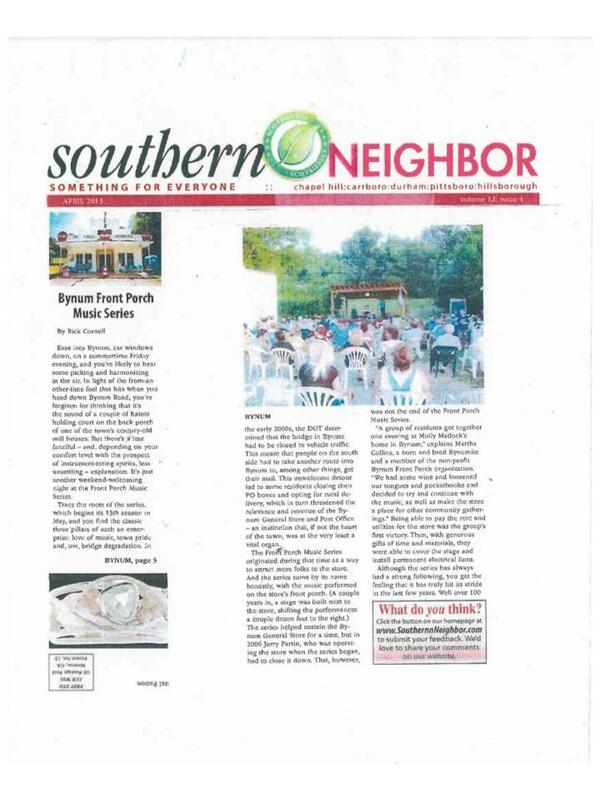 When the General Store's operator retired in 2006, to keep the community gathering place alive, Bynum neighbors banded together and created a non-profit organization called Bynum Front Porch. The organization creates family-friendly events and programs that celebrate the community’s rich history and bright future. We are thrilled each year to present the summer Bynum Front Porch Music Series that takes place at the Bynum General Store every Friday night from May to August. It is open to the public and features a variety of bands including gospel, folk, blues, rockabilly and bluegrass. Other programs include the Bynum Front Porch Storytelling show (September to May), Bynum Front Porch Pickin’ (every 2nd and 4th Saturday of each month), AVID and Art Educational grants to Chatham County Seniors, various children’s programs, a holiday bazaar, community events, and fundraisers. In September 2018 we started winter music shows. Every THIRD Friday through April - the indoor stage will be alive with music from 7 til 9 pm! See our full schedule on Events — or check things out on Facebook. Licensed Electrician - The building and stages could use a few minor repairs and an all over wellness check. Roofer - There are some leaks and flashing that need attention. Community service hours to plant shrubs, spread gravel, help with small carpentry projects. We also need materials such as ceiling tiles, caulk, galvanized nails, siding, tar paper, 5-V tin, etc. Mega music! “Bynum Front Porch! Where the fireflies fly!” Playlist!